Fortunately the morning was fine, and the bay of Hilo presented a pretty appearance. Groves of palm and other tropical trees lined the shore, the surf broke in regular pulsations upon the curving stretch of beach (4), and was made animate by dozens of men and boys at play in the waves (5). For the first time our friends saw some of the sport in the water for which the islanders are famous, though less so at present than in the days that are gone (6). "Each man had a surf-board, which was a thick plank twelve or fifteen feet long and perhaps thirty inches wide (8), and said to be made from the trunk of a bread-fruit tree (9). There were five or six of the natives to whom we had promised half a dollar each for the performance (10). They pushed out with their planks to the first line of breakers and managed to dip under it and swim along by the help of the under-tow. They passed the second line in the same way, and finally got beyond the entire stretch of surf into comparatively smooth water. "Then they tossed up and down for a while, waiting their chance. What they wanted was an unusually high swell, and they tried to find a place in front of it so it would sweep them towards the shore just where it broke into a comber. They tried several times, but failed (11), and we began to get out of patience (12).
" At last they got what they had waited for, while some were kneeling on their planks and others lying extended , with their faces downward, and just ahead of the great comber they swept on at a speed of little, if any, less than forty miles an hour (13). They were just ahead of the breaker, and apparently sliding downhill; one of them ,was swamped by it, but he dived and came up behind the wave and made ready for the next. The others kept on, and were flung high and dry by the surf, and as soon as they could rise from their planks they ran towards us to receive their pay (14). One of the fellows stood erect on his plank while in the surf, just as the Nubians at the first cataract of the Nile stand up, while descending through the foaming water." Canoe at Hilo Bay, Hawai'i circa 1890. Photograph Charles Furneaux, Bishop Museum. Cropped from Holmes (1993), page 77. Surf-rider's attention will focus on the two waves on the right hand reef in the background. 1. 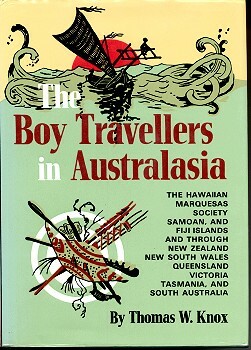 Thomas W. Knox was a journalist and profilic author, most noted for his Boy Travellers series, originally based a a world tour in 1866. The 1888 Australasian volume was produced in conjunction with Australia's centennial. The 10th book in this boys adventure series, Thomas Wallace Knox, (1835-1896) was a journalist, and "self-proclaimed wandering-America," prolific writer, most noted for his Boy Travellers series. The series was based on his world tour in 1866, which provided the historical and geographical accuracy in text and illustrations. Knox's journalistic talents emerged during the Civil War, when he became a war correspondent for the New York Herald. Knox wrote 20 books for this series which became a very popular 19th Century juvenile adventure series. 2. Hilo was a famed surfing location on the large island, Hawaii, and said to rival Waikiki for the quality of it's surf. Finney and Houston identify seven different breaks, page 28. 3. Image, Top of Page. Surfing at Hilo, Page 32. Image, Centre of Page. Hilo, Page 31. Images are credited in PREFACE, page xvi. The publishers have kindly allowed the use of illustrations image was either prepared specifically for the book or taken from the files of HARPER'S MAGAZINE and other of their publications, and those illustrations have admirably supplemented those that were specially prepared for the book. August, Pages 382 to 402 and September, Pages 544 to 559. 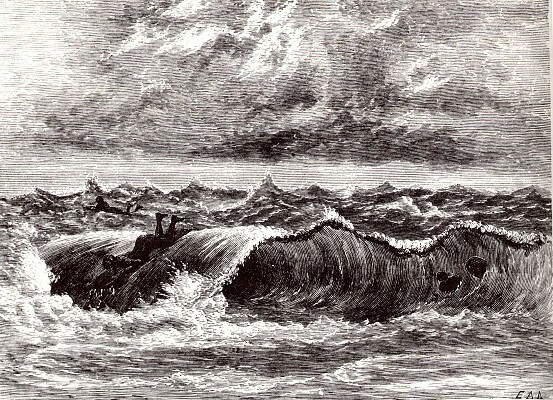 Surfing is described in part one only, (Aug.) accompanied by a woodblock, "Surf Bathing",attributed to Commander William Bainbridge Hoff, of the flagship California. The credit is mentioned in the article only, not in the book. "They look, kneeling or lying on their long surf-boards, more like some curious and swift-swimming fish - like dolphins racing, as it seemed to me - than like men. " Nordhoff, Charles : California, Oregon, and the Sandwich Islands. Harpers and brothers, New York. 1874. 4. Written before the surf in the bay was eliminated by the building of breakwaters to develope a commerical harbour, circa . 5. Notes both adult and juvenille (male) surfers and in significant numbers. 6. Confirms the commonly reported decline in surfing activity since Cook's arrival, circa1780. 7. The format of the book implies that events described by one of the principal charcters are the author's eyewitness observations. Despite some definite inaccuracies, the report has several features tend to confirm this. 8. Probably an over-estimation of the board length, and certainly not 30 inches wide. 9. Bread-fruit (Artocarpus altila) has been identified a a suitable timber for surfboard construction (Finney and Houston, page 42), although existing examples are exceedingly rare. This is probably due to the light weight of the timber. 11. Conforms with contemporary surfing practise. 12. This minor comment goes a considerable way to confirming this as a first hand report. 13. An over-estimation, but certainly emphasises the drama of the activity. 14. The rapid return to the beach of the riders indicates that they were primarily concerned with their payment, the context also possibly indicating relatively poor surfing conditions at this specific time. This would be confirmed by the accompanying image, if it was congruent. Surfers and Alaia, Hilo Bay, Hawai'i circa 1900. 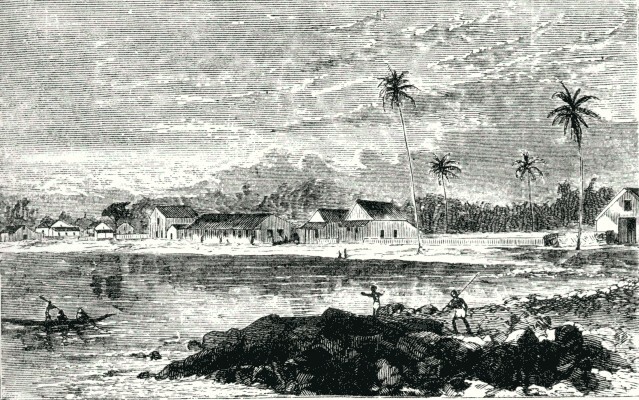 Image, Top of Page : Surfing at Hilo, Page 32. Image, Centre of Page : Hilo, Page 31. Image, Bottom : Cover of the 1971 Edition. T.W.K. New York, July, 1888. Geoff Cater (2006) : Thomas W. Knox : Surfing at Hilo.